A new national project to help boost the computing skills of Welsh primary school children has been launched today (Weds 5 Apr) by Cabinet Secretary for Education, Kirsty Williams. The Barefoot Computing project in Wales aims to help primary school teachers get to grips with computing so that they can inspire and excite pupils aged from five about the world of IT. The initiative is funded and led by BT, which has worked closely with the Welsh Government to ensure resources for the project in Wales are closely aligned to the Digital Competence Framework and are available bilingually via the Hwb digital learning platform. Kirsty Williams visited Cadoxton Primary School in Barry to see a Barefoot workshop in action and unveiled the new online resources for teachers, which have been tailored to the Welsh curriculum in both English and Welsh. The free, bilingual, downloadable resources and lesson plans are targeted to help primary school teachers across Wales, some of whom may not have specialist computing knowledge. The resources focus on concepts such as algorithms, abstraction, programming and data structures and provide ideas on how they can be used in the classroom. 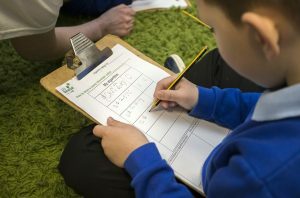 Every primary school head teacher in Wales will be contacted by the Barefoot team to highlight the new resources, which have already won acclaim from teachers elsewhere in the UK. More than one million primary school pupils across the UK have already benefited from Barefoot since being launched in 2014. It forms part of BT’s long-term commitment to help build a culture of tech literacy and reach five million young people in the UK by 2020. “Young people need these skills in order to thrive in our increasingly competitive and digital world while businesses and organisations of all sizes need recruits that are tech literate in order to succeed. “Our children grow up surrounded by technology, but too many have little idea how it all works – their knowledge is only screen-deep. 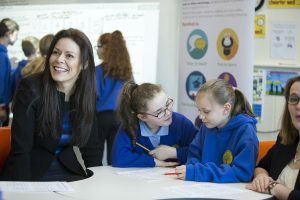 “BT’s tech literacy programme is designed to inspire young people to ‘get’ tech concepts and to find them exciting and relevant, but we’re also aware that teachers need to feel confident to support young people. Pupils and practitioners in Wales can access the bilingual materials at hwb.wales.gov.uk. Schools will soon be able request a workshop to demonstrate how the resources and lesson plans can be used.